The Quai D’Orsay brand is beginning a promising new era. It is doing so by launching a new design and presenting two new vitolas, with international distribution in the major markets of Habanos, S.A.
Quai D’Orsay is presenting the Quai D’Orsay No 50 (50 x 110 mm) and Quai D’Orsay No 54 (54 x 135 mm) vitolas, both in 10 and 25-unit presentations. These will be added to the Coronas Claro (42 x 142 mm) vitola to create an attractive brand portfolio that will be available worldwide in 2017 through the Habanos international distribution network. 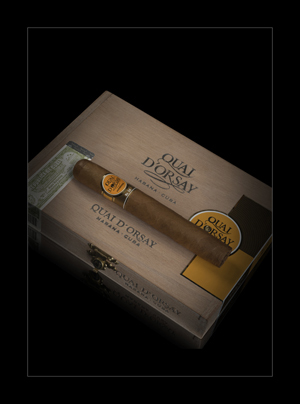 The Quai D’Orsay No 54 (54 x 135 mm) vitola, called Edmundo Grueso, is a new vitola in the regular Habanos, S.A. portfolio. This new challenge for Quai D’Orsay arrives with a new design and new labelling that will reinforce the presentation of its boxes. The band uses its characteristic original structure, geometric lines, but has been increased in size and enriched with different printing techniques, incorporating various gold colours, reliefs and patterns, as well as each vitola’s name. 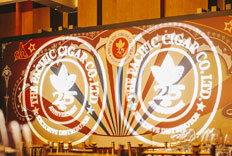 The brand’s origins have also been given greater visibility and presence, with the references to “Habana” and “Cuba” in the centre and on the sides of the band. A simplified version of this new band was presented at the 2016 Regional Edition for the French market, with the Quai D’Orsay Secreto Cubano (40 x 110 mm) vitola. In addition to the band, there is new labelling to reinforce the brand codes in the box, since all packaging will be presented with an innovative bofetón as well as a papeleta costero. 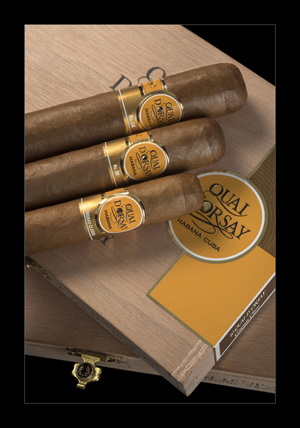 The new vitolas, Quai D’Orsay No 50 (50 x 110 mm) and Quai D’Orsay No 54 (54 x 135 mm), are incorporated into the regular portfolio with the same black Cuban tobacco flavour, smooth, pleasant and elegant, that has characterized the brand since its launch. 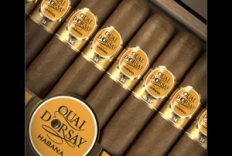 All Quai D’Orsay brand Habanos are made Totalmente a Mano con Tripa Larga – Totally Handmade with Long Filler – with selected leaves from Vuelta Abajo*, the best tobacco-growing region in the world, in Pinar del Río*, Cuba*. 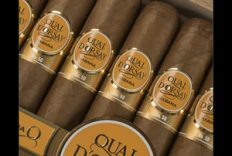 Quai D’Orsay is a young brand within the Habanos range, established in 1973 by Cubatabaco exclusively for the French market at the request of SEITA, the former French state company. The brand’s name itself actually refers to the famous Parisian quai where SEITA had its offices at that time. For over forty years, the brand has remained a discreet jewel in the Habanos, S.A. portfolio, accessible only to expert French enthusiasts. Its major innovations came through Regional Editions, four in the last decade, also exclusively for the French market. This global launch will allow smokers all around the world to discover and enjoy this special Habanos brand with French “charme” and refinement, and with all the flavour, character and intensity of the best Cuban tobacco. * (D.O.P.) Protected Appellations of Origin.